In 2017 Penkridge Station benefitted from 2 art projects. The first project ‘My Village’ engaged school children from Princefield First School St Michaels First School, Marshbrook First School and Penkridge Middle School and is the result of collaboration between the North Staffordshire Community Rail Partnership (NSCRP), Penkridge Parish Council and local schools to give children an opportunity to develop special art for their station to reflect community pride. Through `My Village`, local schoolchildren were asked to draw their own interpretation of what Penkridge means to them. 10 very individual designs were chosen by the NSCRP for display in new poster cases in the station waiting shelters at Penkridge station. The second project People and Places of Penkridge showcased innovative designs, featuring photography of the Staffordshire market town and its people. The designers, James Bayliss, David Errington, Matthew Evans, Emily Harvey-Stephens and Harriet Murray are all Year 12 Art and Design students at Penkridge’s Wolgarston High School and are currently studying for a BTEC in Art and Design under the direction of Mark Smith, Marketing Manager at the Penk Valley Federation of Schools. The research process for the project involved working with the community, including local traders, to build up a portfolio of images to inform the final designs. The new artwork comprises two large contrasting canvases, each five metres in length, featuring the message ‘Welcome to our community’. These have been installed as a permanent display on each of the two station platforms, creating a much-improved welcome to the station and gateway to the town. 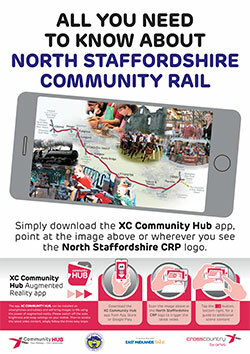 The project is a joint venture with North Staffordshire Community Rail Partnership (NSCRP), which worked closely with Wolgarston High School to develop the designs, and with the Association of Community Rail Partnerships (ACoRP) who provided sponsorship from their Small Grants Fund.